← Are We the Living Dead? Never underestimate the power of random acts of kindness. Last week I was passing through New York and on my way to an event. While in NYC I’m usually a subway kind of guy, but when looking at maps.google.com the subway line closest to me and my desired destination appeared to be having some issues. I lucked out that there was a bus line with a straight shot uptown. I arrived at the bus stop with enough time to sit, stand, and walk a bit back and forth. As the bus approached I realized everyone was holding white tickets. The doors of the bus opened as I asked a woman next to me if one needed a ticket if they had a metrocard. “Was this an express bus,” I asked? I rushed over to the ticket machine through the traffic of commuters stepping off the bus. With panicked eyes I clumsily searched for what I needed to do. And then I heard her voice, gently giving me directions, and repeating directions as my fumbling fingers tried to catch up. I could feel that everyone must have boarded by now, and any normal bus would probably have left. I grabbed my metrocard, urged the white slip to print more quickly through my concern, turned, and jumped towards the open doors of the bus just in time to hear the bus driver say, whoever is holding the door in the back of the bus, please step away. We’re not friends and I didn’t have the chance to ask her name. Chances are good that we will never see each other again. She had no real incentive to stretch out her neck, or to lend a helping hand. And if I missed the bus, would it have been a huge deal? But in that moment, such a small gesture of kindness meant a lot to me. Something that is small to you may be big for someone else. When was the last time you chose to go just a bit out of your way to help someone else who seemed to be in need? How lucky am I that this picture just happens to be a shot of the bus I talk about above? 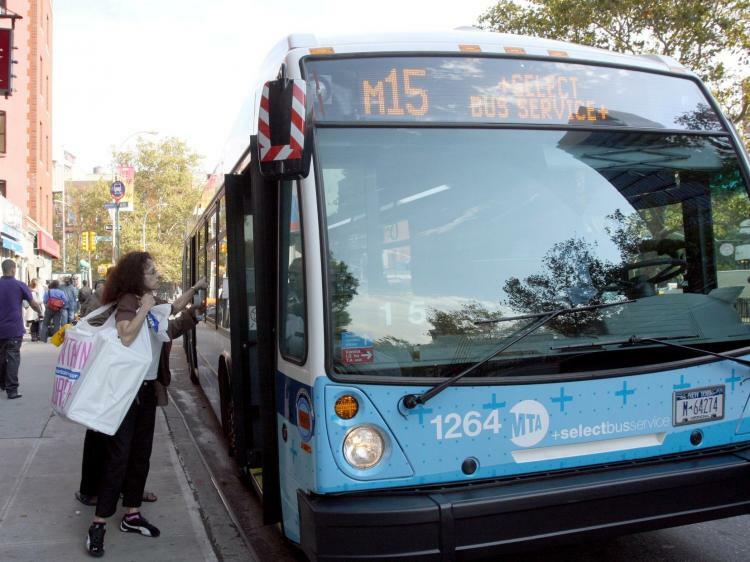 This shot of the M15 SBS comes from this article in The Epoch Times, New Express Bus Hits First-Day Bumps (October 13, 2010). I am not betting that you will never see this womamn again. Fate and MCK tells me that next time it will be you holding the door for her.